An art-science dance performance that explores stories of an unexpected disease diagnosis and how it changes a person’s perspective. The dance shares a journey through diagnosis, challenges, triumphs and hope. After the dance, there will be a question & answer session with participants including UCL/UCH researchers, dancers, and patient-advocates. These conditions are severely disabling and the people behind these stories share a common and powerful story for overcoming the challenges associated with them. Tickets include the Q&A and programme; Event proceeds support people affected by brain and spinal cord illnesses. This evening performance is commissioned and collaboratively developed by Movement for Hope and performed by Tanztheater Adrian Look. Additional collaborations include UCL/UCLH researchers, patients and volunteers. This event is supported by Movement for Hope, UCL and The Physiological Society. This short piece was created to engage mainstream public and initiate a call of support for neurological conditions. Sarah inspired is Movement for Hopes first awareness film. The film features Sarah Ezekiel, who has Motor Neurone Disease (MND), and her 14 year old daughter Aviva, a young dancer and story teller who choreographed the dancing in the film for her mother. Motor neurone disease is a progressive neurological disease that attacks the upper and lower motor neurones. The disease progressively disables a person disrupting voluntary movement, such a walking, onward to involuntary movement, such as breathing. Sarah has lived with the or over twelve years now. At the start of this film we wanted to know what kept Sarah going and how she has found her identity once again. The film has reached over 18,000 people and been featured in prestigious venues such as the Bloomsbury Theatre. Sarah now sits as an honour art member of Movement for Hope’s board and an active member of our steering committee. Her story has evolved into several awareness projects and she has taken the reins of her life’s hobby, painting, back from the reins of MND using special adaptive eye gaze equipment. This equipment allows her to communicate with her family, friends, and fans. Below features the inspire video and several other videos of Sarah’s. This short film is an awareness-education and inspiration film that was developed between three countries, including the United States and Canada, where it was filmed, and the United Kingdom for post production. The short film features two people who have Tourette Syndrome and suffer from involuntary movements and sounds that affect their everyday lives. Joel Goldman is a best selling crime writer that spent the bulk of his career as a trial lawyer based in Canada. He has adult onset of tics and expresses some of his experiences through the art of writing and character development. Sutie Madison is the founder and artistic director at Band of Artists, based in the United States. She is a professional dancer and musician who also has Tourette Syndrome. She expresses the involuntary tics that she has through her dance style. She describes the sequence of movements that she has during a tic, as a combination similar to a dance. Joel and Sutie are from different generations and have taken very different paths to rediscover themselves and their identity. Despite their differences in expression, they both arrive at the same conclusion about their illness. Dancing that mixes styles and embraces the surroundings of New York as its backdrop–a story-telling adventure of hope and public awareness for two movement-debilitating neurological conditions. This film series was a Movement for Hope project with a group of talented young dancers, directed and produced by the Gwen Rakotovao company. It features prestigious international dancers across several genres of dance, including contemporary dance, locking, waacking, jazz, and tap dance. The project was inspired by the Move Hope Project, which featured awareness for two movement-debilitating conditions called Multiple Sclerosis (MS) and Motor Neurone Disease (MND). 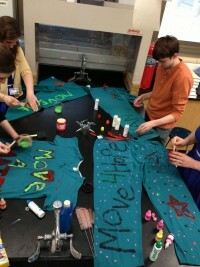 The Move Hope Project’s mission was to connect science and art in a unique way to raise awareness for MND and MS. The two diseases currently have no cure. The GRC video series uses various definitions of Move, Hope, and Project to raise awareness and inspire others! The film series received international coverage in the UK, Paris, and New York. Click on the videos below to watch the entire series. 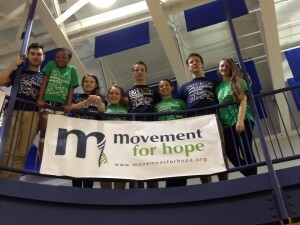 Movement for Hope held its first dance-a-thon in the United States! The initiative was lead by a group of young students in a program called JAVA, John Adams Volunteer Association. The programme started with a large Skype education programme in which students participating in the dance-a-thon learned about neurological conditions and what their impact is on society. To improve awareness and funding support for neurological conditions. 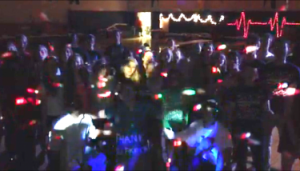 The students then planned together and took the initiative to run a large school-wide all night dancing event!! The dance-a-thon was titled “Move 4 Health”, where students and the local community danced all night long and raised $2000 to support people with neurological conditions! 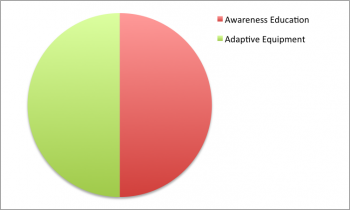 Proceeds from the event will be split equally for research, awareness education, and adaptive equipment purchases to improve the outcomes for people with brain & spinal cord illnesses! After two years of being the UK Bboy Championships’ official charity, Movement for Hope and UK Champs celebrate their achievements together! 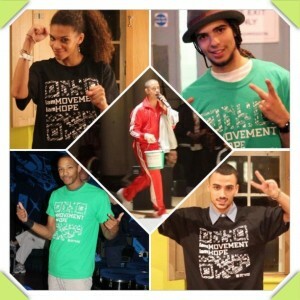 Movement for Hope is proud to have been the first ever charity that the UK Bboy Championship World Finals supported. Likewise, at the inception of Movement for Hope, the World Finals was one of our first partnerships and gave us a ‘leap forward’ for more innovative ways to raise awareness for brain and spinal cord illnesses on the world stage. 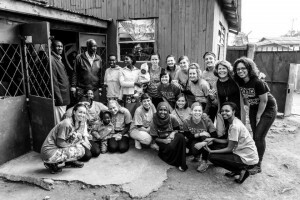 In 2013, the funding raised at the World Finals 2012 went towards co-funding the rehabilitation supplies for two clinics in the slums of Nairobi (pictured right), as well as piloting a novel education model in two schools (pictured left) pairing dance, film and education on epilepsy, a prevalent neurological condition in Africa, where 9 out of 10 people go untreated due to lack of access to medical treatment and current stigmas surrounding the illness. In years previous, funding from the UK Bboy Championships World Finals 2011 went to support several awareness-education projects supporting to movement debilitating neurological illnesses, called Motor Neurone Disease and Multiple Sclerosis (i.e. 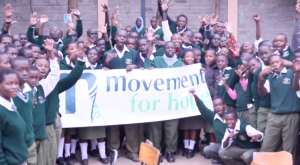 the Move Hope Project). This project was featured internationally in the USA, UK and France. Then in 2012, Movement for Hope and the UK Bboy Championships partnered on an awareness video developed from the event to showcase how alike we are despite our level of ability. The running slogan for the 2012 World Finals campaign slogan, “Life is a Battle”, was a prelude to the short film (below). The film features world class dancers from around the globe, with a particular focus on the 2011 winners. At the 2012 event itself, the legendary Crazy Legs went out into a crowd of over 3,000 people with our donations bucket to help support the cause, and donated an autographed t-shirt which raised an immediate few hundred pounds towards the cause. In a ground-breaking move to Birmingham our partnership has extended online and we are happy to share continued support from some of leading world-class patron dancers! *There will be more content from our UK Bboy Championship World Finals partnership launching soon. Movement for Hope and UK Bboy Championship World Finals are partnered again this year to raise support for neurological conditions through dance!! The best street dancers in the world will dance face-to-face in the biggest battles of the year in the United Kingdom. 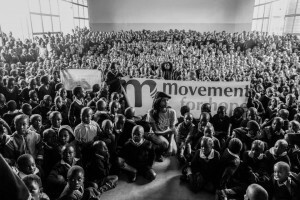 Movement for Hope will be there to represent the leading cause of disability (and in some cases death) worldwide. It seems neurological conditions are the best kept secret that affect all of our lives. The world health organisation estimates as many as one billion people in the world are affected by neurological conditions. Movement for Hope and UK Bboy Championships, make a powerhouse team of innovation and celebration of dance for a cause that is all around us.